My husband, Evan, and I often find ourselves eating a late dinner. We both work until five and then head to the gym to burn off all the yummy calories we’ve eaten. By the time we get home, shower and take a moment to relax, we typically find ourselves eating at 9:00 p.m. (or later). Eating much later on the weekends is common. Just ask any of our friends who come over for one of our frequent dinner parties. As you can imagine, we have to plan our meals carefully to accommodate our schedule. This often means feasting on the many leftovers stocked in our freezer (“cream of icebox”, as Evan’s grandmother used to call it). That does take a bit of fun out of cooking, though, so we try to come up with at least a handful of easy meals that we can prepare fresh each week. This recipe for chicken with a tomato and olive reduction is a perfect meal for a busy weeknight (though it does create a lot of dirty dishes)! I found the original recipe in a Cooking Light magazine years ago. And have since made some slight alterations. 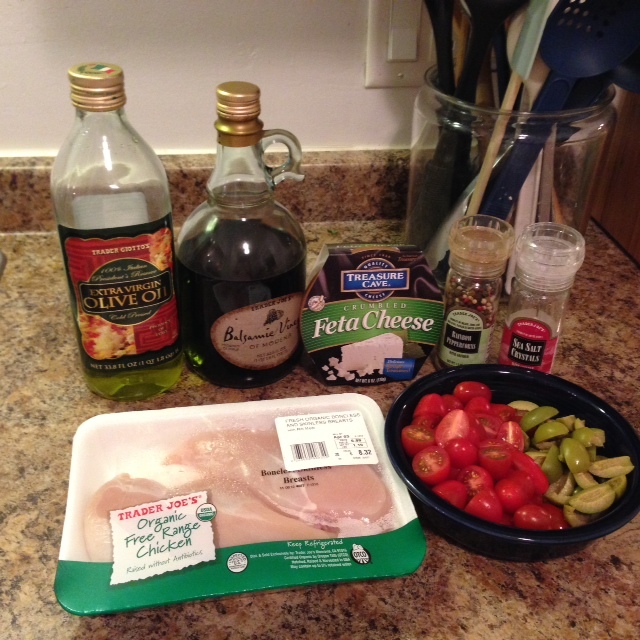 The ingredients for the base recipe are few: chicken, grape tomatoes, green olives, olive oil, balsamic vinegar and feta. I prefer to serve this dish with quinoa, an ancient superfood, but rice works, too. And be sure to add something green on the side! We include something green with every dinner. And as you will see, tonight’s green of choice is steamed broccoli. To get started, trim four skinless, boneless chicken breasts. Season them with a healthy helping of freshly ground black pepper and some sea salt. Heat your favorite non-stick frying pan on medium-high heat with a coating of coconut or olive oil. We prefer coconut oil because olive oil is not meant for high temperature cooking (it tends to scorch). Once your pan is HOT, add the chicken and begin searing. While your chicken is cooking, wash a pint of grape tomatoes, and then slice them in half. Place them in a small sauce pan. Slice 10 Queen pimento stuffed olives in half lengthwise. Remove the pimentos and then slice each half lengthwise again. Add your olive quarters to your sauce pan with the tomatoes. Add 2 tablespoons each of balsamic vinegar and olive oil. Cover and set to simmer over medium-low heat. 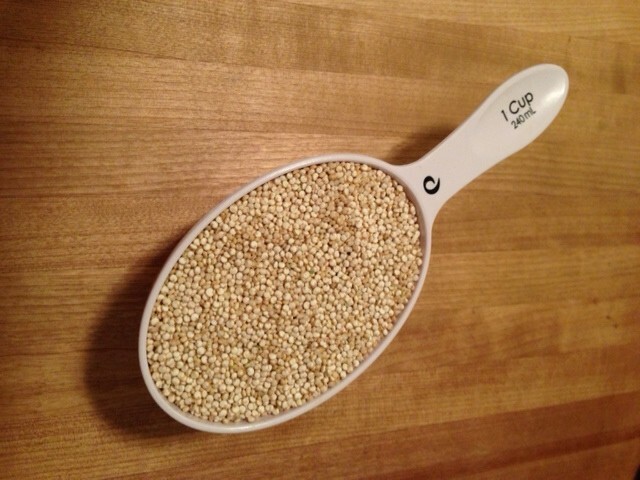 Next, put one cup of uncooked quinoa in a medium sauce pan with two cups of water. Bring to a boil, then reduce to a simmer and cover until done, about 10 – 15 minutes. If you decide to use rice instead, follow the cooking instructions given, but be sure to note that rice takes longer to cook so you should start it sooner than you would the quinoa. Don’t forget about your chicken! It should be ready to flip (depending on the heat) after about 10 minutes. Wait until the underside is crisp and browned. 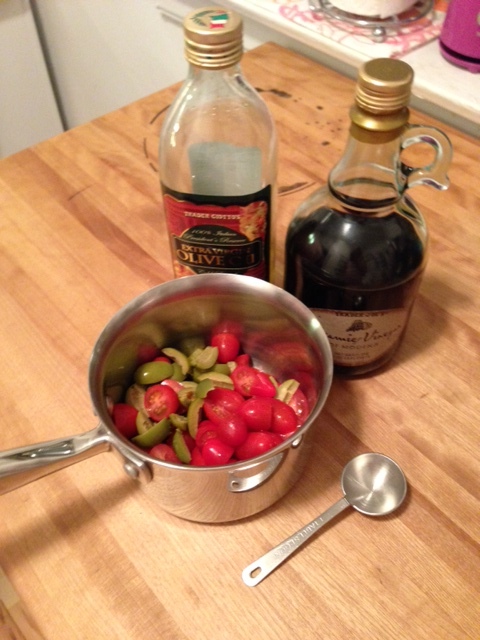 Your tomatoes and olives should be simmering nicely by now, creating a delicious sauce. Make sure to allow for the proper cooking time of your green side of choice. This dish is best served with a sprinkle of feta cheese over the top. There is an ethnic grocery store up the street from us that sells freshly sliced feta. This is our best and favorite option. However, some days, time is tight and we have to decide between freshly sliced deli feta or the pre-crumbled version. This time, I went with the pre-crumbled version due to time constraints. 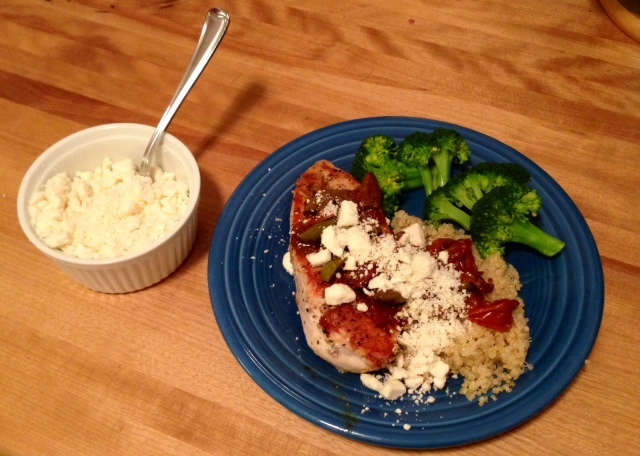 If you have the time for a fresh slice of feta, crumble it with a fork and set aside in a separate dish. If your timing is right (and mine rarely is), everything should be done at the same time. 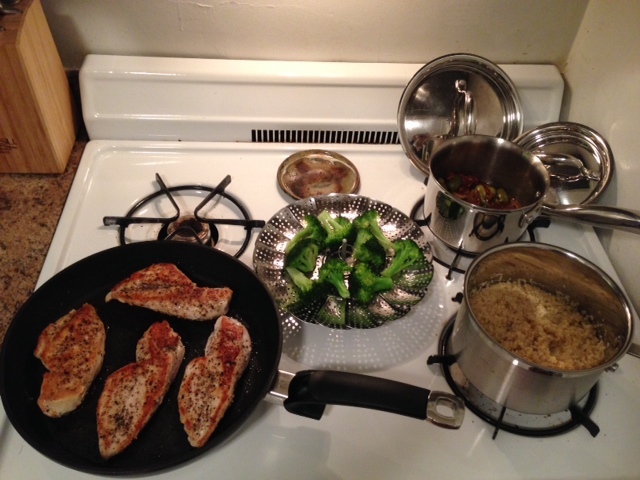 Plate the meal with one piece of chicken, a spoonful of quinoa and a side of greens. Top the chicken and quinoa with the tomato and olive sauce. Sprinkle with feta. This is a great dish to serve when you have company over. It is easy, delicious and colorful. That’s it. It is that simple. You are ready to eat. ENJOY! 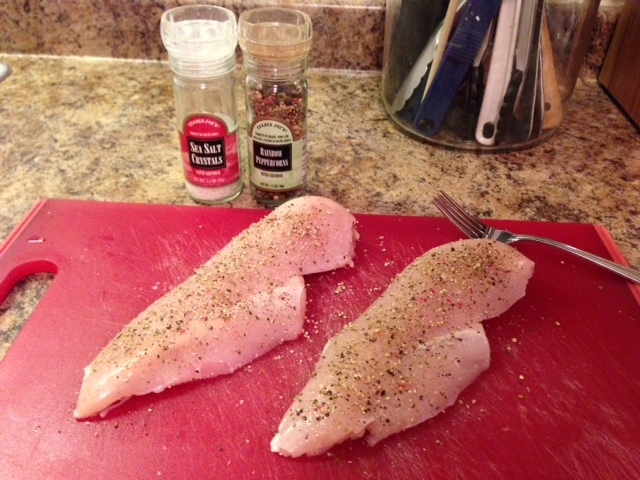 1) Trim chicken and season with salt and pepper to taste. 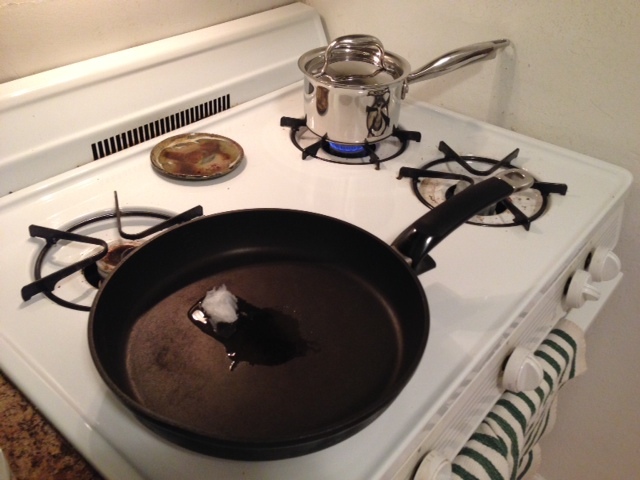 Heat a non-stick frying pan over medium-high heat with 2 Tbs coconut oil (you can eyeball it). Once pan is hot, add chicken to sear on one side. 2) Wash and slice tomatoes in half. Place in a small sauce pan. Slice green olives in half lengthwise, remove pimentos and slice in half lengthwise again. Add to sauce pan with tomatoes, 2 Tbs olive oil and 2 Tbs balsamic vinegar. Cover and heat to simmer. 4) After chicken has cooked for 10 minutes on the first side, flip over and sear the second side – about 7 minutes. Flip the chicken once ONLY! 5) Plate the chicken with your chosen sides. Top with tomato and olive sauce and feta. Serve immediately and enjoy! sounds great, always need new chicken dishes.